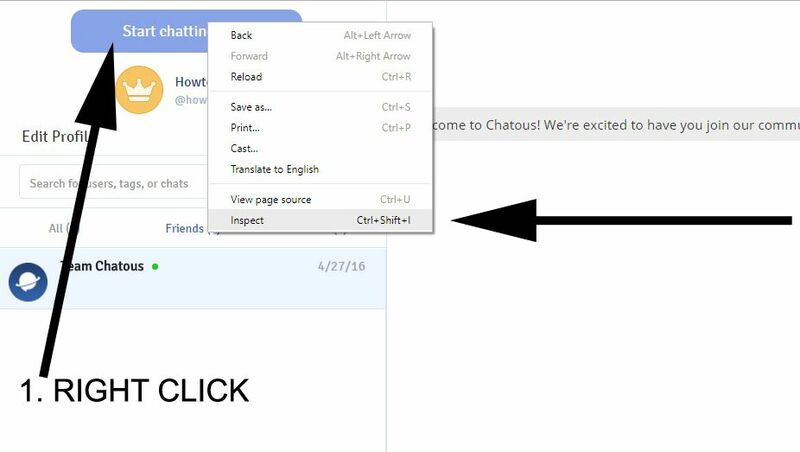 If you think that text chat has been disappeared from Chatous at all, you are mistaken about that. You can still go to website of Chatous and you can chat with people on text chat. If you don’t know how to do that, you will find a step by step guideline on here. If you have any questions regarding this problem, please feel free to contact us. Chatous has removed this feature from the website, that is right but it still exists technically on the service. Let’s give you some information about how to fix this problem and how to text chat on Chatous one more time. Please take a look at our video guideline below first, if you don’t want to watch the video scroll down. You need to do following steps to text chat on Chatous. These steps are for Google Chrome. Many browsers have already these settings, you can try these steps on your device too. 1-) Firstly enter website of the Chatous and enter to the chat platform. 2-) Right click on “Start Chatting Now!” button. 3-) Click on “Inspect” from the list. Please check the picture below. 4-) A windows which includes some codes will appear on the browser and you will see a code line as “<div id=”newVideoChat”>Start chatting now!</div>”. 5-) Double click on “newVideoChat” to edit it and then change it with “newTextChat” and hit enter. 6-) Now click on “Start Chatting Now!” button to begin to chat with strangers on text as same as at the picture below. If you have any question about text chatting on Chatous, you can ask us through commenting this page. We are going to provide you information about this issue on our video channel too. You can subscribe our Youtube Video Channel to get latest tips and recent news about chat websites and applications. You can also contact us, ask us through our Q&A service and join our community. Have fun!